Throughout both summer and winter in Ohio, your vehicle’s electrical system needs a constant flow of power to function properly. Whether it’s the immense demand from your starter or the constant pull from the audio system, the battery needs to operate at its best to supply that electricity. While your car’s battery typically lasts just three to five years, routine battery service is often all it takes to maintain good power flow. To keep the power flowing in your electrical system, visit Chickasaw Garage for battery service. Our team is friendly and courteous, demonstrating superior customer care while conducting dependable battery service and replacement for drivers throughout Mercer County. At Chickasaw Garage, every vehicle repair is performed by an experienced, ASE-Certified technician, including our battery service. We understand the rigors your electrical system places on the battery, and we will ensure it lasts as long as possible through routine battery service. 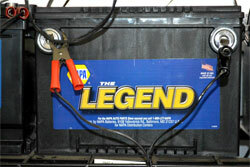 If your battery is weak or fails its test, we’ll recommend a quality replacement. Ultimately, you can trust your vehicle to start for years to come. If your Ford Super Duty needs its battery terminals cleaned, we will do it. If your Hyundai Santa Fe needs its battery replaced, we’ll take care of it. If your Nissan Altima requires a battery service and load test, we’re your solution. At Chickasaw Garage, we stand behind our work, including all battery replacements, with the Napa AutoCare Warranty.